On April 10, lawyers in Gunnison County met for the annual Karl Ranous Professionalism Award dinner. Every year, the bar association gathers to honor a local lawyer who exemplifies the values and practices of professionalism. This year, the Gunnison County Bar Association honored Hon. J. Steven Patrick, the Chief Judge of Colorado’s 7th Judicial District. Judge Patrick sets the tone and a high standard for lawyers practicing in the 7th Judicial District. This is a well-deserved recognition of the professionalism displayed in Colorado courts. We also heard a presentation from Jim Coyle, head of Colorado Attorney Regulation Counsel and Barbara Eyzk , Executive Director of the Colorado Lawyer's Assistance Program. Bob O’Hayre presented Judge Patrick with this year’s award. On March 16, I had the opportunity to meet with some of the lawyers of the Northwest Colorado Bar Association in Steamboat Springs. I gave a CLE presentation on "Ethical Considerations in the Use of Freelance Legal Services." 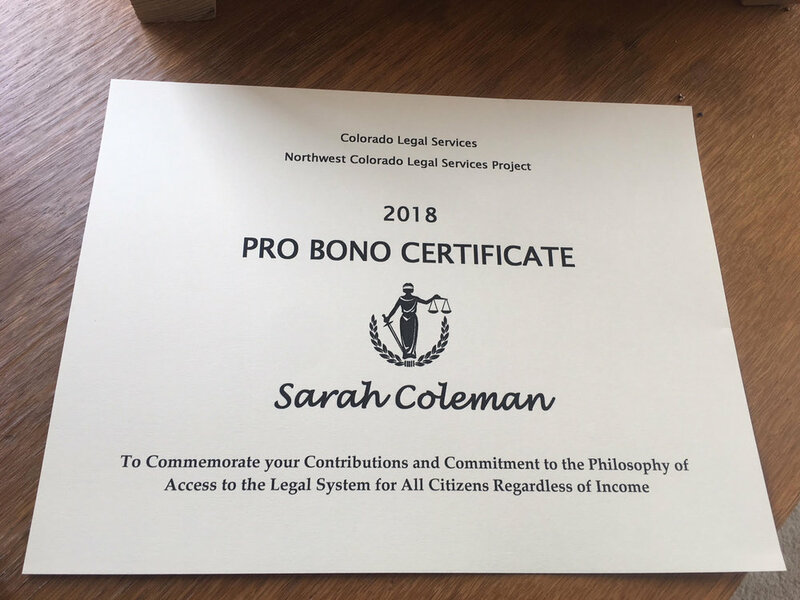 I especially love giving this presentation to lawyers in rural Colorado because they are mostly solo/small firm practitioners--and that's a group that can really benefit from freelance work and extra support from time to time. I also especially love giving this presentation in another ski town! On October 27, 2017, the Colorado Bar Association Ethics Committee adopted Formal Opinion 133, Ethical Duties of a Lawyer who is Party to a Matter Speaking with a Represented Party. This Opinion considered a lawyer's ethical obligations in a unique factual situation: may a lawyer who is a party to a legal matter discuss the matter with represented party without first obtaining that party’s lawyer’s consent? In this scenario, the lawyer who is a party to a matter (lawyer/party) can either be pro se or be represented by separate counsel. The lawyer/party’s ethical obligations with respect to communication with opposing parties turns on this distinction. The relevant rule is CRPC 4.2, Communication with Persons Represented by Counsel. The rule states that, “[i]n representing a client, a lawyer shall not communicate about the subject of the representation with a person the lawyer knows to be represented by another lawyer in the matter, unless the lawyer has the consent of the other lawyer or is authorized to do so by law or a court order.” A previous decision by a Colorado Supreme Court Office of the Presiding Disciplinary Judge identified three purposes of the rule: (1) to protect represented persons from overreach by opposing counsel; (2) to protect the attorney-client relationship from interference by opposing counsel; and (3) to reduce the risk that persons might disclose to opposing counsel confidential information harmful to their case. A lawyer/party may proceed pro se in a legal matter. In that case, the lawyer is actually acting as their own counsel. Colorado disciplinary decisions establish that, when a lawyer is pro se, CRPC 4.2 applies to the lawyer’s communication with other parties. A pro se lawyer will violate CRPC 4.2 by communicating directly with a represented party without their lawyer’s consent. Thus, when a lawyer/party proceeds pro se, CRPC 4.2 prohibits the lawyer from directly communicating with a represented party absent consent of counsel. When a lawyer is represented in a matter, CRPC 4.2 does not prohibit the lawyer/party from directly communicating with the represented party about the matter. On September 26, 2017, the Colorado Bar Association Ethics Committee adopted Formal Opinion 132, Duties of Confidentiality of Will Drafter Upon Death of Testator. This Opinion outlines the limited circumstances under which a lawyer who drafted testamentary instruments for a client (“drafting lawyer”) can reveal client information following the client’s death. As a preliminary matter, the Opinion notes that confidentiality does not end on a client’s death, and so lawyers must continue to observe the duty of confidentiality after the death of a client. C.R.P.C. 1.6, 1.9(c)(2). There are four situations where a drafting lawyer may reveal information about a client’s intentions or instruments following death. First, the client may have authorized the drafting lawyer to make such disclosures. Second, the Personal Representative of the deceased client’s estate may authorize the drafting lawyer to make such disclosures. The Personal Representative “holds the rights to the client information.” Colorado Bar Association, Opinion 132. In that case, the “disclosure should be no broader than necessary to carry out the decedent’s wishes.” Id. Third, a court can order the drafting lawyer to disclose such information. Colorado Rule of Professional Conduct 1.6(b)(8) allows a lawyer to reveal confidential information in order to comply with an order of the court. Finally, the drafting lawyer may reveal client information if any of the other exceptions listed in Rule 1.6(b) are applicable, such as the crime-fraud exception. Unless one or more of the four situations outlined above applies, “simply retaining a lawyer to draft estate documents without more, is not sufficient to constitute implied consent for a lawyer to voluntarily provide information protected by Rule 1.6.” Id.